Happy New Year from Team Yesware! 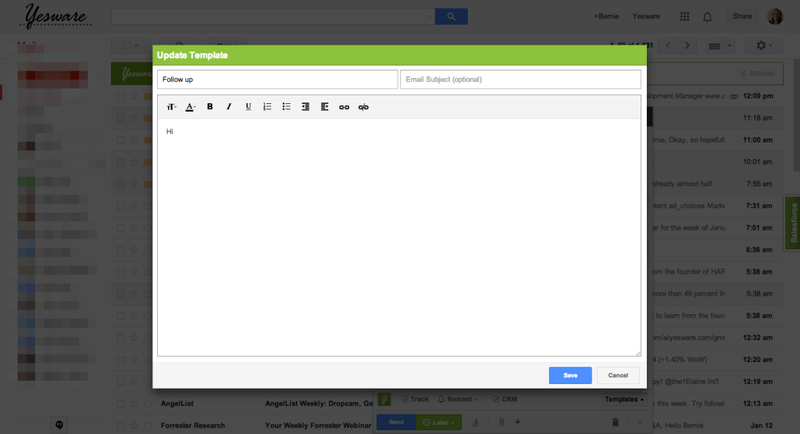 One thing we’ve missed ever since Google got rid of Old Compose was the ability to edit templates in Gmail. We have added it back, and made the edit window bigger so things are easy to see. Want to send a proposal or a white paper at a time it’s more likely to be read? Go for it: Send Later now supports attachments. If you’ve been following our blog, you know that Google has made some changes to the way they load images in Gmail. Google is now serving up images via their proxy servers, which masks locations and device types. Google also caches the images, which means multiple opens can be missed. Good news: The latest version of Yesware now provides a workaround to these changes, so that you can continue to track multiple opens by recipients and distinguish between sender and recipient opens. Make sure you’re on Yesware version 2.0.93 or later and grant us additional permissions to keep tracking effectively. Note: You can still get location and device data by using Yesware link tracking. Yesware has always believed that location and device type can help you provide more value to your recipients by using that information to give them more relevant data. While you can’t do this with opens as often, you can still get this information through click data. For opens in Gmail, we will now show “Gmail” instead of Google’s proxy server location. As Yesware nears the 400,000 users mark, we’ve started showing some growing pains. That’s why we decided to devote most of our fourth quarter to improving performance and reliability, and making sure we can support the many more users we’ll have onboard in 2014. You should notice your dashboard updating with new events faster, notifications showing up sooner, and the Salesforce sidebar loading more quickly. We’ve got a list of big things we’re planning for 2014. Feel free to share with us what you’d like to see!